KIEV, Ukraine -- Ukraine has told all schools and higher education institutions to close in an effort to save gas, after its Russian supplier refused to deliver more fuel. This Soviet-era monument in Kiev is - like much of Ukraine - under several feet of snow. Russian energy giant Gazprom - one of the world's largest natural gas suppliers - said it was unilaterally severing its contracts with Ukraine. Gazprom made the announcement after a Stockholm court ruled against it at the end of a long-running legal battle. Ukraine is also a major channel for gas piped to the European Union. EU officials in Brussels voiced concern about the supply of gas to the bloc at a time of freezing weather across much of the continent. 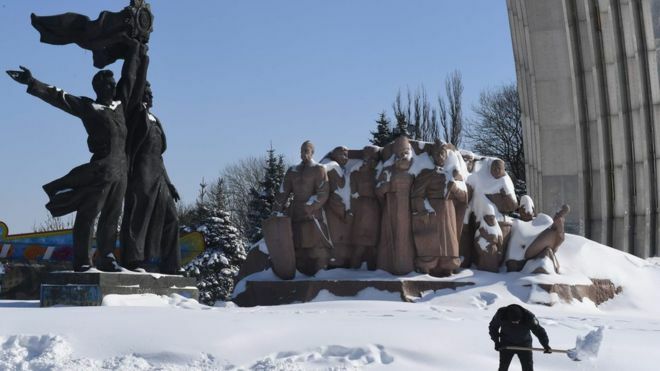 Gazprom's refusal to deliver its fuel resulted in conservation measures across Ukraine, where heavy snowfall has caused travel chaos in Kiev and other cities. The government has told power stations to switch to fuel oil generation where possible. The energy ministry recommended that educational institutions close until next week at the earliest, though each area will make the decision itself. The dispute between Gazprom and Ukraine dates back years. Ukraine's national gas company Naftogaz said it was owed compensation for a lack of agreed supply and for transit fees through the country's pipelines. Gazprom, meanwhile, claimed that Naftogaz had not paid it fully for the gas it agreed to buy. The ruling by a Swedish court this week - designed to end the dispute - found the calculations of who owed what came out in Ukraine's favour by $2.56bn (£1.86bn). But on Thursday, Gazprom did not resume supplies, reportedly returning a payment Kiev had made in advance. It has also asked a court to unilaterally annul its contracts. Gazprom director Alexei Miller told Russian news agency RIA Novosti that it was "economically inexpedient and unprofitable to continue with the contracts" and that his company had no intention to "solve Ukraine's economic problems at its own expense". Ukrainian President Petro Poroshenko said he was certain the contracts would remain in effect, and accused the company of "attempts to use gas supplies as a leverage for political pressure". This is not the first time that Russia has blocked gas supplies to Ukraine: it cut supplies because of price disputes in 2006, the winter of 2008-09, and again in 2014. The gas dispute has at times been characterised as a proxy for the larger political animosity between the two nations, particularly after the annexation of Crimea by Russian forces in 2014. On Friday. the EU offered to step in and broker a deal if necessary.